Records About Isbell’s Naval Gunfire Support During the Vietnam War, documenting the period 3/1966 – 1/1973. (Full, fielded search page is here.) Records are from the The U.S. National Archives and Records Administration. Captain Arnold J. Isbell was assigned command of the aircraft carrier USS Yorktown near the end of World War II. 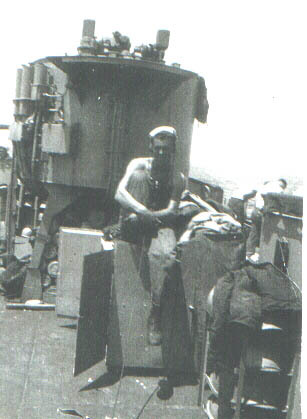 It was while enroute to that assignment aboard USS Franklin that he lost his life when the Franklin came under attack near Okinawa. 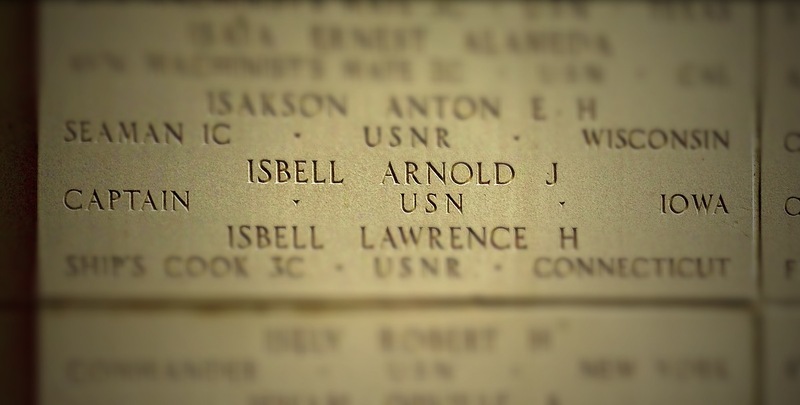 Captain Isbell’s name is etched in the Honolulu Memorial at the National Memorial Cemetery of the Pacific as one of those missing in action, or lost or buried at sea in the Pacific. 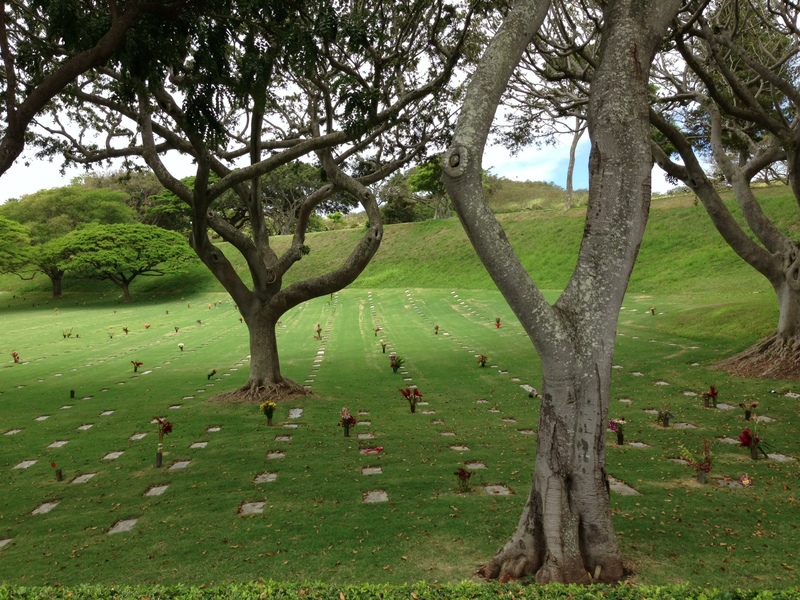 Below is Captain Isbell’s name and the serene setting of his permanent memorial. Thanks to Richard Villelas for contributing this news article from The Oregonian, reporting on the Isbell’s visit to Portland for the 1947 Rose Festival. Click here, or on the image below, to read the entire article. Jim Perino provided these photos of the first Korea cruise. 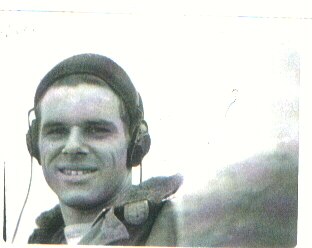 “I Served on the Isbell from late 1948 to late in 1950. I was in the Deck force. I served when commander Johnson was the Captain. We made a cruise to Hawaii, Okinawa, Shanghai, Tsingtao, Hong Kong, Subic Bay, Manila, Cebu city, two other Philippine ports, and home to San Diego. “We were in a Typhoon just out of Okinawa. We went to Tsingtao to take the American Counsel General and his family aboard as the Communist army was coming. We could see the gunfire flashes at night. We were off Tungsha Banks when the Chinese Army of Chang Kai Shek came down the Yangtzee river on anything that floated. Care not if the other ships men are quizy. Keeping the ship together, looking her best. Now try find another ship that’s more keen. But every man is there, and without a shirk. Now do it with a zoom, we’re part underway. Be quick and smart, work fast with a laugh. Stand-by to cast off, forget girls and wines. Fantail has Hardwick, he wouldn’t stay below. We must pick up both boats, and gripe ’em in. Chop-chop ‘u sailors, Vowell says “look alive”. Some man pass a stopper, make sure she locks. Set her in the skids, shoe her with a fling. Except two guys per boat, make up the falls. Forward two men by anchor, ready to let go. So then begins another, deckape’s work day. 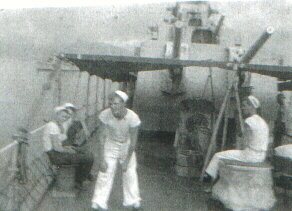 – Vowell was Boatswain Mate 3/c in charge of this detail. – Chief Brower was in charge on the focsle. – Hardwick was was in charge of the fantail….he was Chief but was busted back to Boatswain 2/c. 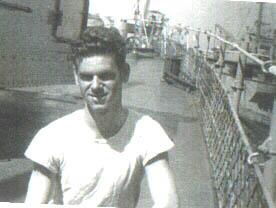 – Ray Bright was Coxswain to the motor whale boat, supply detail. The following three photos provided by William E. Jarvis. 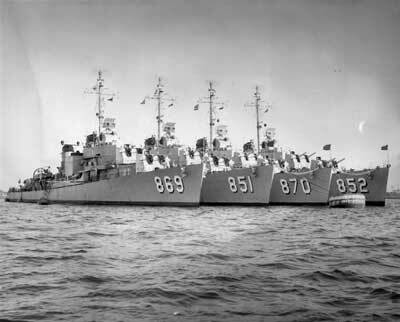 USS Arnold J. Isbell, USS Rupertus, USS Fechteler, USS Leonard F. Mason (circa 1949). USS Arnold J. Isbell (Circa 1949). Ens. 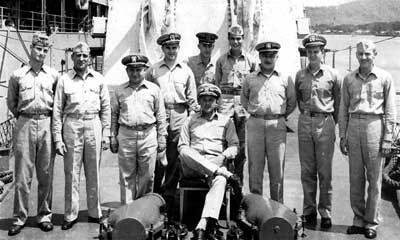 Charles A. Hotchkiss, LT M. A. Medeiros, LT Clyde L. Rule, LTJG Richard J. Ferree, LTJG William J. Mullenmeister, CDR Charles R. Johnson (seated), LTJG Joe M. Landtroop, LCDR George W. Miller, LTJG Donald V. Wanee, LT Edward J. Myers. Absent Ens. W. E. Jarvis. (Circa 1949).